Legacy Homes by Biagioni was born from the desire to create a luxury building company that has not only years of knowledge in all facets of the industry but a strong focus on modern design, premium architecture, and prestigious homes. With over two decades of building and construction experience, Robert Biagioni leads the business with direct involvement in each contract and with each client. As the Director of Robert Biagioni Constructions and a registered builder, his honesty, integrity, and meticulous craftsmanship have ensured his longevity in the industry. 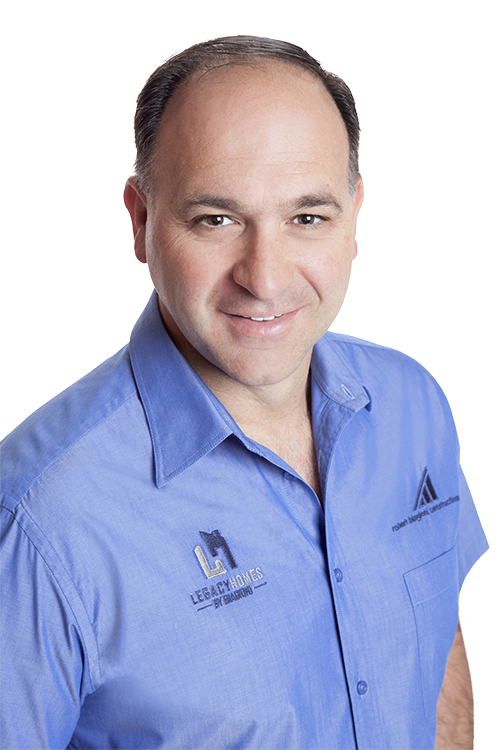 Robert founded Robert Biagioni Constructions in 2005 with partner Anthony Chun. He is a registered builder with 30 years of experience in the building industry. Rob is a bricklayer by trade who progressed from managing a brickies team to site supervision working with various builders including Mirvac-Fini and Ross Griffin Homes. This experience gave Rob the broad construction knowledge and people skills to take on the responsibility of a builder. Rob gained his builder's registration in 2005. His substantial experience as a tradesman and site supervisor defines Rob's approach to building and that is of the traditional builder who is on site and on top of all the issues on sites, maintaining high standards and ensuring that construction is of a high quality. Rob takes pride in all RBC projects and is involved with each one at every stage. Rob always maintains direct contact with our clients ensuring that client requirements are met at a high standard. Dean has over 20 years of experience in all aspects of project and contracts administration. Dean was awarded a Bachelor of Building/ Construction management from Deakin University, Geelong in 1995. Post-graduation he spent two years as a project engineer for Geelong builder Wycombe Constructions before relocating to Western Australia. Dean spent nearly 5 years as a senior estimator with EMCO Constructions in Perth before joining Mirvac (WA) as a contract administrator in 2002. Dean was promoted to a senior contract administrator in 2005 and then Development Manager in 2007. During this period Dean worked on projects such as Coolbellup New Living ($25m), Kwinana Grouped Housing ($20m) and the Port Kennedy Development ($300m). Dean joined Robert Biagioni Constructions in 2009 as the Contracts Manager and has played a key role in helping RBC grow to the company it is today. Dean is a member of the Australian Institute of Building (MAIB). Marcus is a young enthusiastic project administrator who has joined the RBC team. He completed a Bachelor's Degree in Construction Managment Economics at Curtin University of Technology in 2014. While studying Marcus began with RBC as a trainee and was appointed a project administrator upon graduation. Project experience includes Lowanna Way (23 units in Armadale), Triplex Queens Park, and custom homes up to $800k in value.